SENIOR TREVOR Olson drives to the basket during first-half action Thursday night in Huron. The Blackhawk boys took home second place from the 281 Tournament after a nail-biter of a championship game. 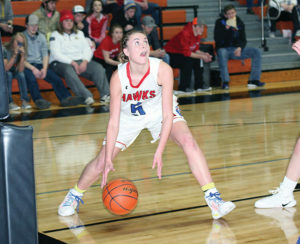 The score stayed close through three quarters, with the lead flip-flopping between the Hawks and the Warbirds, but Wolsey-Wessington found their footing in the fourth to widen the gap and take the win, 59-46. Trevor Olson led the Hawks with 17 points and five assists. Logun Feistner had 10 points and 12 rebounds. SCW had some trouble shooting, hitting just 17 out of 58 for 29 percent from the floor, but made six out of nine free throw attempts and had 35 rebounds. The Hawks took good care of the ball, committing just five turnovers. Riley Gohn led the Warbirds with 23 points, while Bennett White added 19 points, 12 boards and five steals to the contest. W-W grabbed 28 rebounds and also had just five turnovers. The Warbirds improved to 9-0 with the win, while SCW fell to 7-3. SOPHOMORE AND high point earner of the night, Megan Poyer, gets low before going up for two more Thursday in Huron. Poyer put up an impressive 25-point performance in the game. 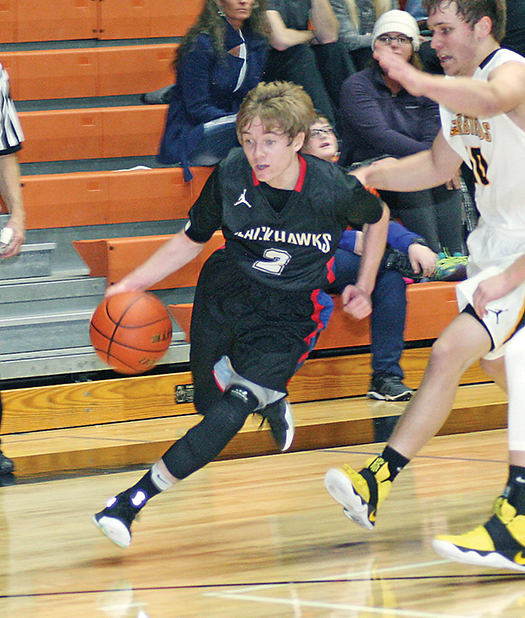 The Blackhawk won the 281 Tournament Championship again this year after an easy, 64-29 win over Highmore-Harrold last Thursday night in Huron. Sophomore Megan Poyer had a breakout performance with a game-high 25 points and seven rebounds. Myah Selland put down 19 points and five assists in the win. The Hawks shot 24-of-39 from the field for an awesome 62 percent from the field. Halle Kroeplin led the 8-4 Pirates with 10 points. SCW remains undefeated with an 11-0 record and are rated No. 2 in the SD Sportswriters polls behind No. 1-rated, 11-1 Ethan. A Republican South Dakota lawmaker resigned this week after admitting to engaging in consensual sexual relations with two legislative interns in 2015 and 2016. 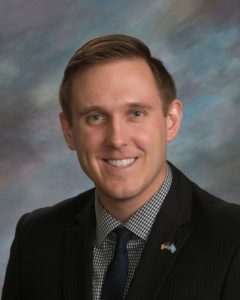 District 8 Representative Mathew Wollman (R-Madison) sent a letter of resignation to House Speaker Mark Mickelson on Monday. He had faced an investigation by House leadership to determine how Wollman might be disciplined after admitting to his actions last Wednesday. Wollman, 26, was elected in 2014 and re-elected this past November. District 8 includes Sanborn, Miner, Lake and Moody counties. Governor Dennis Daugaard has stated that he will “act quickly” to appoint a replacement for Wollman. Both of the interns were over 21 years old and neither of them worked for Wollman. The state’s legislative rulebook forbids lawmakers from sexual harassment, but does not explicitly prohibit sexual contact with interns or legislative pages. …Read a letter Wollman released to the Sanborn Weekly Journal Monday morning in this week’s issue.